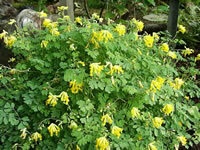 Corydalis lutea is a short lived perennial wildflower that is very easy to grow and care for. They grow 12"-15" tall and gradually form 24" diameter mounds of light greyish-green, fern like foliage. Sprays of bright yellow, 1" tubular flowers begin to appear in early May and will continue until the first frosts of Fall. Yellow Corydalis should be planted in full sun but will also tolerate light shade. They prefer to grow in moisture retaining but well draining, slightly alkaline soil. 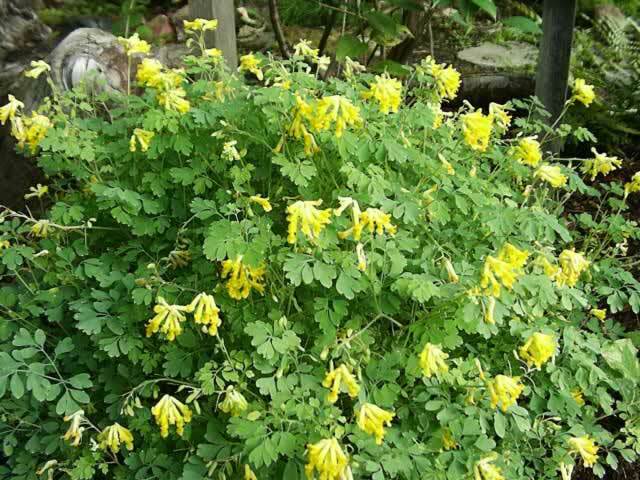 Yellow Corydalis plants resent being transplanted once they have become established but they are prolific self-seeders that will provide you with plenty of seedlings which can be transplanted in early spring. 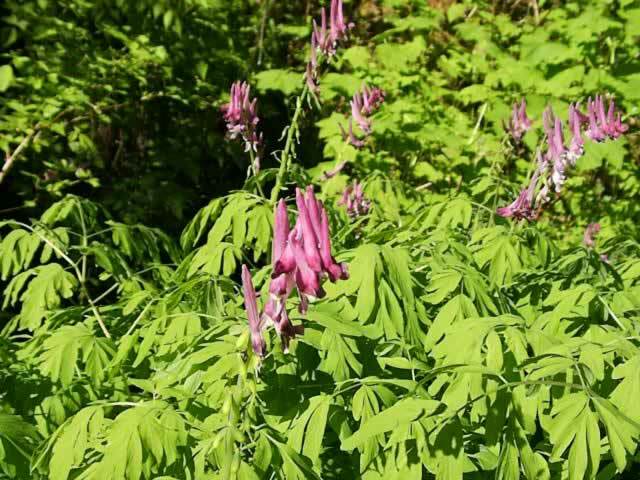 Corydalis scouleri is a perennial wildflower that is native to western Washington, Oregon and parts of southwestern British Columbia. Scouler's Corydalis will gradually form a 3 foot clump of 3 foot stems of light green, lace-like foliage. Spikes of hot pink, tubular flowers appear in late spring and continue into summer. Scouler's Fumewort plants grow best in cooler climates where they are planted in moist, humus rich, slightly acidic soil, in a shaded area of the garden. They are excellent plants for growing next to streams and ponds. Scouler's Corydalis self seeds readily, but does not become invasive. Blue Corydalis is a slow growing, evergreen perennial that will eventually form a dense 18" clump of elegant, 12" tall, lace-like green foliage. 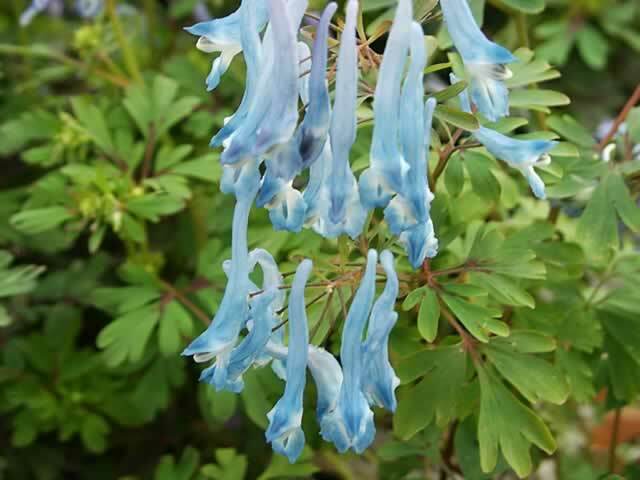 Eighteen inch spikes of dangling, tubular, sky blue flowers will adorn the plant from late spring until fall in regions with cool summers, but in hotter regions, Corydalis flexuosa plants tend go dormant in mid summer, sometimes coming up again in the fall. They prefer to grow in moisture retaining but well draining, humus rich soil where they will receive partial to full shade. 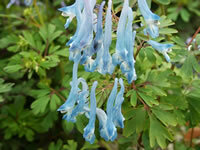 Blue Corydalis plants resent drought. 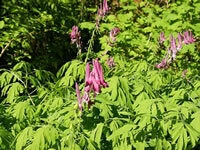 Corydalis plants can be propagated by carefully dividing established clumps in early spring. Seeds should be sown directly in the garden where they are to grow, in the fall. If you intend to start your seeds indoors, they will need to be stratified (chilled) in the refrigerator for a month before sowing them, then maintain a temperature of 65°-75° within the growing medium for germination in 15-30 days.